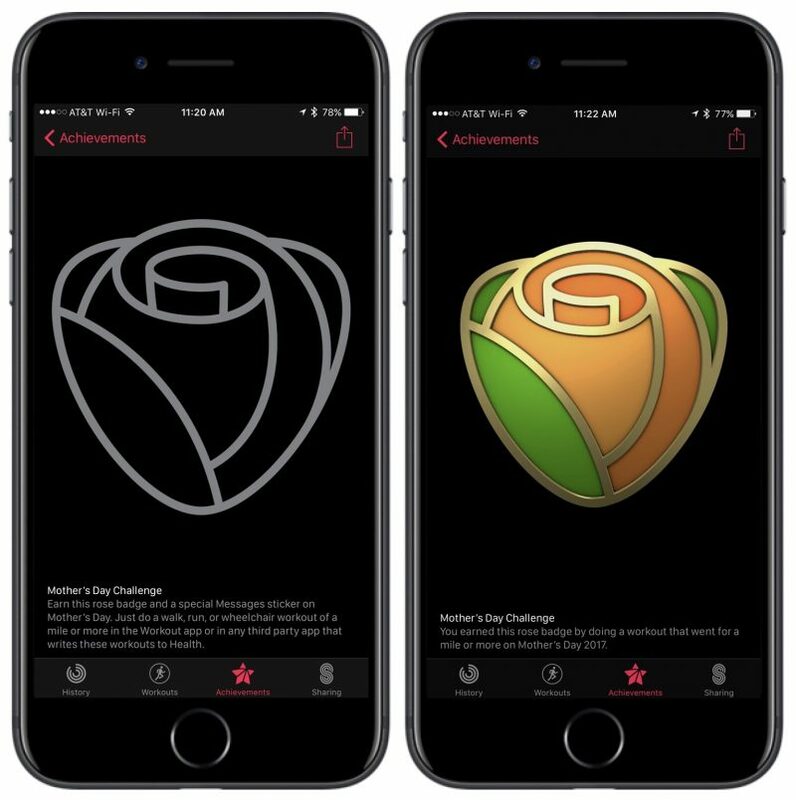 Mother's Day takes place in the United States this Sunday, May 14, and Apple is gearing up to launch an all-new challenge in the Activity app for Apple Watch owners in order to celebrate the national holiday. The challenge will begin showing up in the Activity app this Friday, May 12, but will only be open on Sunday. To accomplish the challenge, users will have to complete a walk, run, or wheelchair workout that lasts for one mile or longer on Mother's Day. Users who meet that goal will get a Mother's Day achievement in the Activity app, and a sticker to use in Messages. The challenge will only be available to Apple Watch owners in the United States (via 9to5Mac). "Earn this rose badge and a special Messages sticker on Mother's Day. Just do a walk, run, or wheelchair workout of a mile or more in the Workout app or in any third party app that writes these workouts to Health." Mother's Day will mark the fourth public challenge that Apple has debuted for Apple Watch owners, coming after a 3.1-mile workout on Thanksgiving, an Activity ring competition in January to celebrate the New Year, and a 30-minute outdoor exercise on Earth Day. Apple Watch owners can track their Mother's Day workout through Apple's own Workout app, or using any third party app that can connect and track exercise data through the Health app. Similar to the previous Activity challenges, users will have only the designated window -- in this case, one day -- to complete their workout before the achievement and sticker are no longer able to be earned. I will do the mile in memory of my mother, who died in December. I usually like these challenges, but I think I'll spend that time with my mom instead. No love for Canada? I love collecting badges! Great, hopefully people get out and burn some calories. I can't imagine how this could a bad thing. Don't worry. I'm sure someone here will figure out how this is a bad thing before the thread hits a second page. I love Apples sense of inclusivity, with the mention of a wheelchair workout. Even so, the Watch can at least help motivate those who struggle with weight, and serve as a motivation device with fitness tracking. There have been lots of Watch users who have lost significant weight loss with the aid of the Watch. It really is a useful tool. I don't have a mom. I'm an orphan you insensitive clod!